Here are some of our additiioanl new car buying tips. Using our car buying advice and tools, you'll get a great deal that is still more than fair for the dealership. If you'ren't prepared then prepare to get ripped off, it's that simple. People have no problem taking weeks to plan a vacation, but don't spend a few hours doing research before they get a $30,000 vehicle. You'll be able to save a ton of money if you follow our advice. The number one goal of any car dealer is to get you in the door. If you'ren't there they can't pull any tricks or scams on you. They hire the best advertising and marketing companies to come up with ads to get you there. Advertisers spends millions in psychological wording research to trick you. Take a look a the image to the right. You thought it said "I love Paris in the Springtime" right? Wrong! See the extra "the"? It really says "I love Paris in the the Springtime." Your brain tricked you. Advertisers rely on your brain to trick you so they don't have to lie. Take a look at our collection of misleading dealership ads so you'll what to look out for. You think dealers have just one way to coax money out of you when your purchasing a vehicle? Thank you for playing. Some dealers convince you to spend so much, you didn't know you were taken for a ride! Consumers who brag of high trade in value were asleep at the wheel leaving money on the table in other parts of the deal. The dealership is always trying to maximize their profit. Of course they should make a fair profit on the deal but they shouldn't rip you off. They trick you into a bad deal using what I call the "Car Dealer Cash Flow Shell Game™"
The dealer low balls your trade-in, charges full MSRP, high APR on the auto loan, high profit extras, dealer prep and ad fees and ends up with a huge profit. If you have bad credit they'll lie and say that credit life insurance is required, get more profit and call you 2 weeks later to tell you financing fell through and you need to come up with $2,000 more. A similar abuse of the situation occurs if you're upside down on your current auto loan. If they know you're a trade-in buyer, they give you what you want for your trade-in. But look what else they do. They jack up the price to MSRP, pile on extras and fees. The amount of cash involved doesn't change, it gets shuffled around the buckets. Here's a good one. They bait you with 0% or a low APR. But then they jack the price to MSRP, low ball your trade-in, pile on fees and dealer extras. Note again that their profit is still the same large amount. 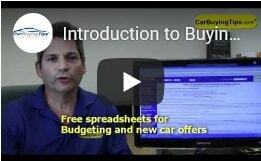 The folks here at CarBuyingTips.com hope you had fun playing the Cash Flow Shell Game. Dealers have perfected this system over decades. The odds are in their favor. Don't get me wrong, dealers have the right to be profitable. You should know how the game is played, so it can be played on a level playing field. The dealer can make a fair profit while you get the automobile of your dreams.